I was recently contacted by the Community Manager for Chairish, which is a curated buy and sell site for vintage furniture and accents. She asked if I would make a style board using mid-century modern items from their site. With the mid-century modern trend in full swing, I wanted to use some mid-century pieces in a more fun and modern way. Many people don't realize how versatile this style really is! 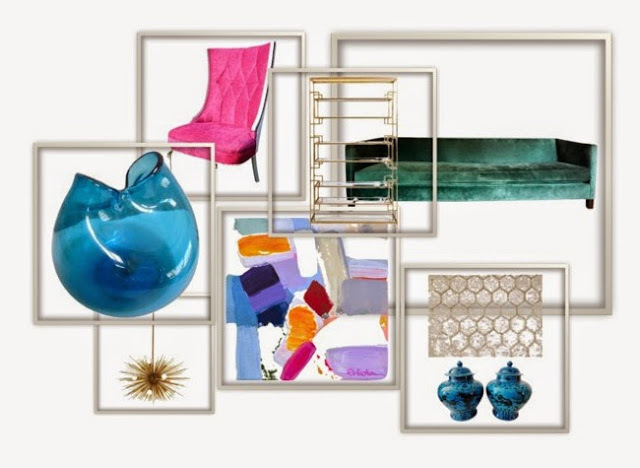 Instead of the traditional mid-century colours (like burnt orange and avocado) I chose bright colours that felt young and fresh and paired them with gold accents and lots of neutral space (think white walls to let the eyes relax) and I created a living room inspiration board using Polyvore. Here's a link to my set. Do any of you use Polyvore? I think I'll be using it more often. I've never really reached pro-level on Pinterest and I like that Polyvore will help you make style boards. What do you think?